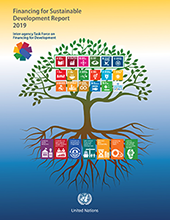 The 2019 Financing for Sustainable Development Report (FSDR) of the Inter-agency Task Force on Financing for Development warns that mobilizing sufficient financing remains a major challenge in implementing the 2030 Agenda for Sustainable Development. Despite signs of progress, investments that are critical to achieving the Sustainable Development Goals (SDGs) remain underfunded and parts of the multilateral system are under strain. The FSDR recommends that the international community should use this opportunity to reshape both national and international financial systems in line with sustainable development. If we fail to do so, we will fail to deliver the 2030 Agenda. The 2019 FSDR begins with the global macroeconomic context (chapter I). The thematic chapter (chapter II) presents four building blocks to operationalize implementation of the Addis Agenda at the country level though integrated national financing frameworks (INFFs). The remainder of the report (Chapters III.A to III.G and IV) discusses progress in the seven action areas of the Addis Agenda. Each chapter begins with a summary that highlights key messages and presents policy options. Each chapter gives updates on implementation, and lays out challenges and policy options on both the national and international levels.